Unemployed Margaret Loughrey, from Co Tyrone has won almost £27 million in the Euromillions lottery – the biggest jackpot ever won in Northern Ireland. Her ticket had matched five numbers and two lucky stars. She had been looking for a job, and had checked her ticket on a hunch. On learning of her good fortune, she kept her head and arranged for the money to be deposited in her bank account. Margaret says, the money won’t be all hers for very long as there are people she wants to see to. 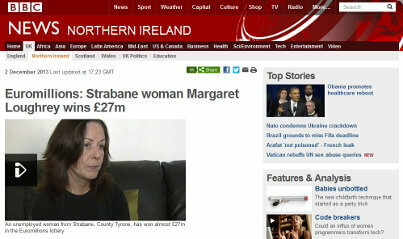 She also does not see any sense in having all of the £27 million to herself and being lonely. She wants to see to it that she thinks out everything and gets to use the money to help people close to her. She also shares that she has no intention of leaving her hometown. Yes, I want to be enjoying the lottery jackpot too.